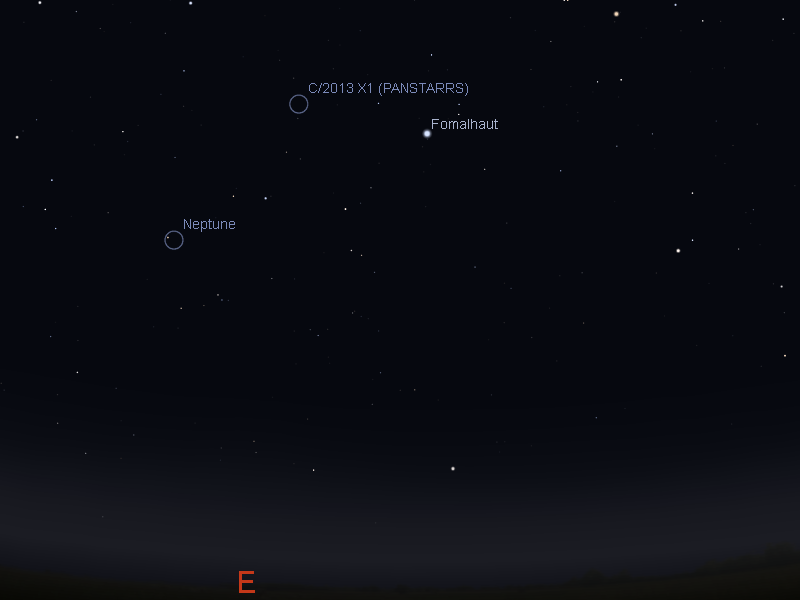 Comet C/2013 X1 PanSTARRS as seen at 2 am facings east from Adelaide. Similar views will be seen elsewhere in Australia at the equivalent local time. Click to embiggen. Comet C/2013 X1 PanSTARRS is brightening and is around magnitude 6.4, which is just below undaided should be easily detectable in binoculars as a fuzzy blob. 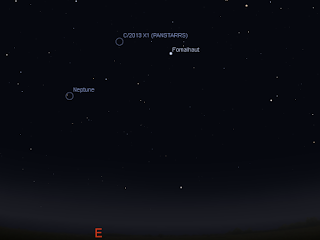 The comet is near the Aquarius - Piscinus Austrinus border, just across from the bright star Fomalhaut by about two binocular diameters. For the next few days (4 - 6 June) the comet is close to the iconic Helix Nebula. At magnitude 7.3, this low surface brightness nebula may be seen as a small disk in binoculars. The comet is closest on June 4 at 11:50 pm AEST when it is just half a moon diameter away. However, although the comet rises before 11 pm observers will need to wait until after 1 am on the 5th for the comet and nebula to rise above the horizon murk and be clearly visible. 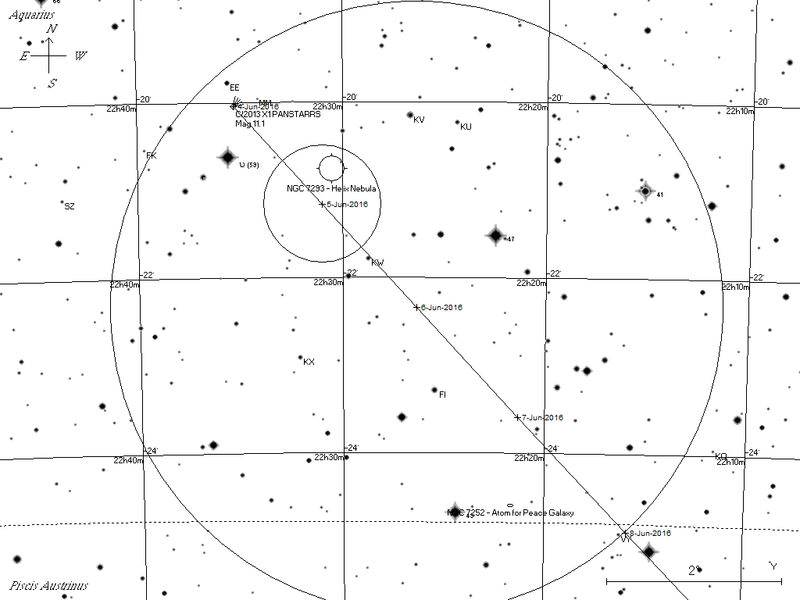 Printable black and white map suitable for locating comet C/2013 X1 PanSTARRS, the large circle is the field of view of 10x50 binoculars, the smaller on the FOV of a 24 mm eyepiece for a 114 mm Newtonian reflector. 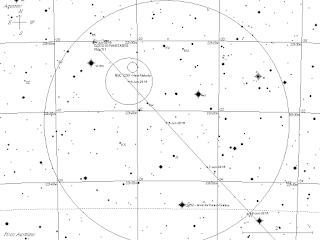 Us the chart above to find Fomalhaut, then hop over northwards by about two binocular widths to find the comet. The first reasonable bright star you come to is upsilon Aquarii, and the comet is not far from that star. Ironically, you may need to find the comet in the telescope to locate the nearby nebula, which is harder to see in a telescope eyepiece than in binoculars.